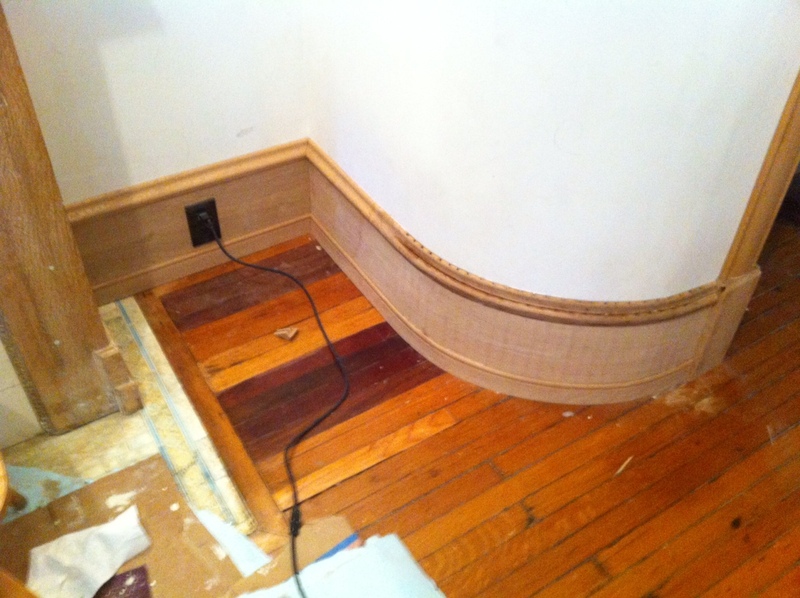 Early on when we decided to add a half bath to our living room, we designed a curved wall to have a lesser impact on the room, to be of the time period of our house, and also it’s just fun! 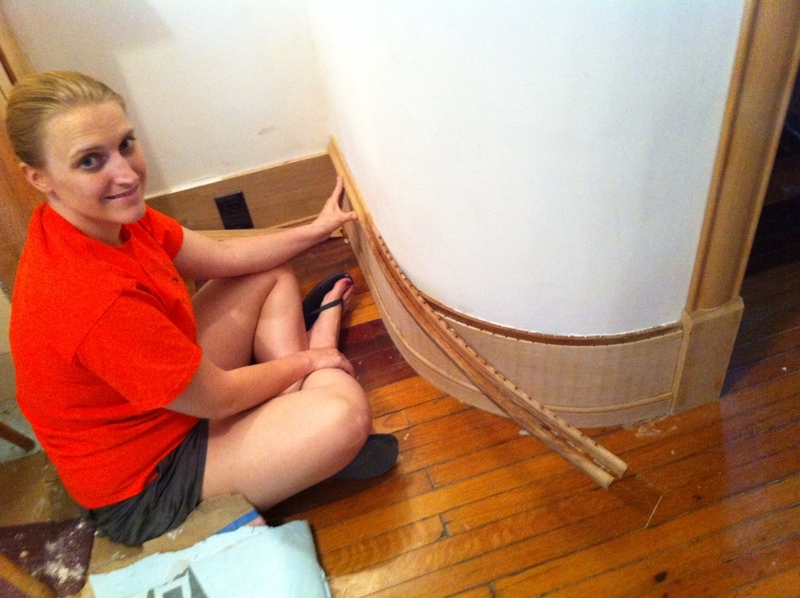 Of course curved walls are harder to build than straight ones! 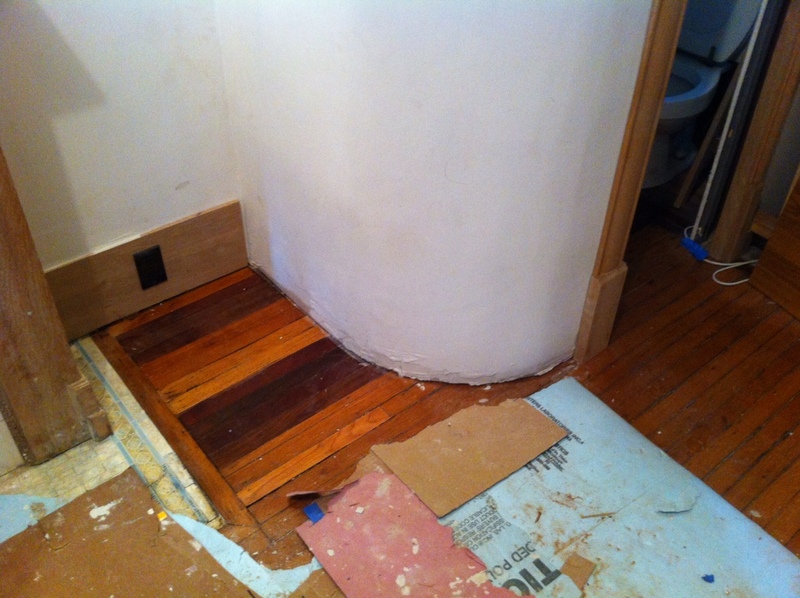 From the framing to the drywall, to the step we are on right now… The trim! 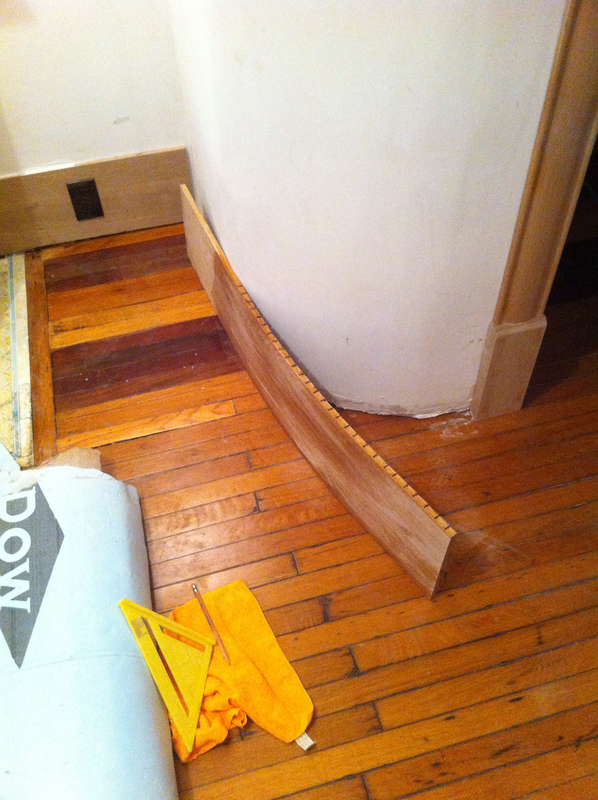 We are installing a 3 piece baseboard to match the original using new white oak. It will have a stained not painted finish so we need to leave as much of the natural face grain intact which adds an extra challenge. Oak is a hardwood and not very flexible. 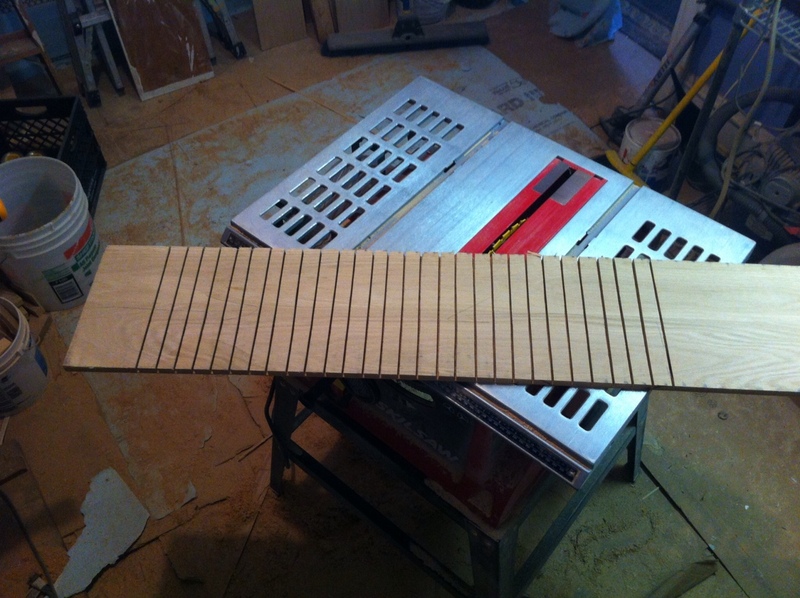 So we started by kerfing the back of the wood, by cutting slots 3/4 of the way through at a regular spacing. The center section of the base is 1/2″ deep by about 9″ tall. So now we are ready to wrestle the wood into the curve. It took the two of us pushing, pulling, and nailing to get it to conform to the wall but it came out great. Kelly gave it a light sanding and we are on to the next two pieces. 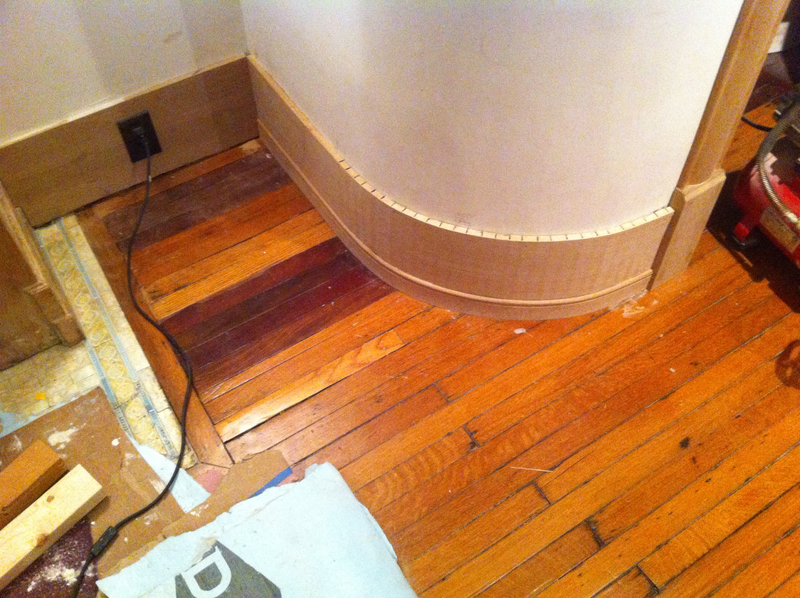 The shoe molding is only a 1/4″ thick so after some soaking it was not too difficult to put up. The real challenge was the cap because it is an inch deep and due to the profile if we kerfed the back you would see the cuts on the surface. 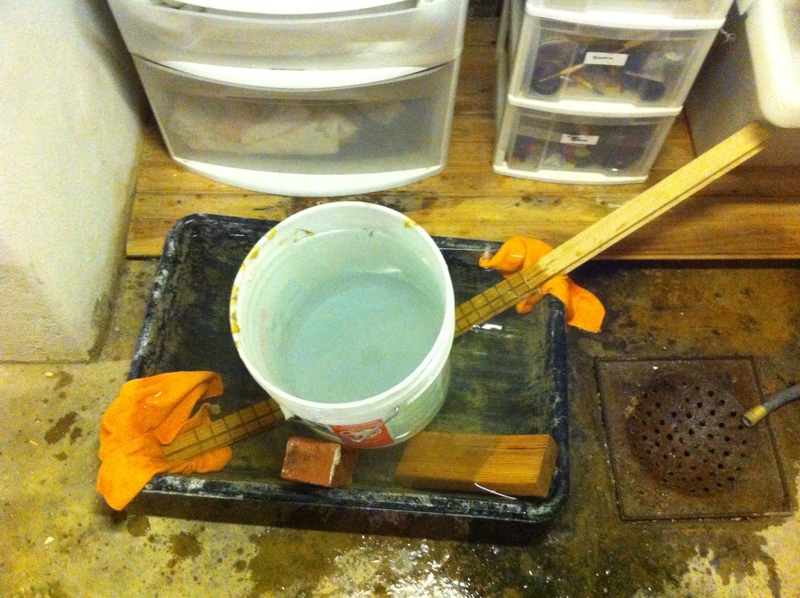 We first attempted to steam the wood using a boiling pot of water on the stove, a rain downspout to hold the wood, and the condensate running into the sink. (Again Kelly loved this when she came home!) If I were to do this again I would cap the end to hold more of the steam in and maybe use a plastic pipe so it didn’t get so hot. When the wood came out we tried our hardest to get it around that curve, but unfortunately it was just too thick to bend to that tight of a radius- so back to the drawing board. 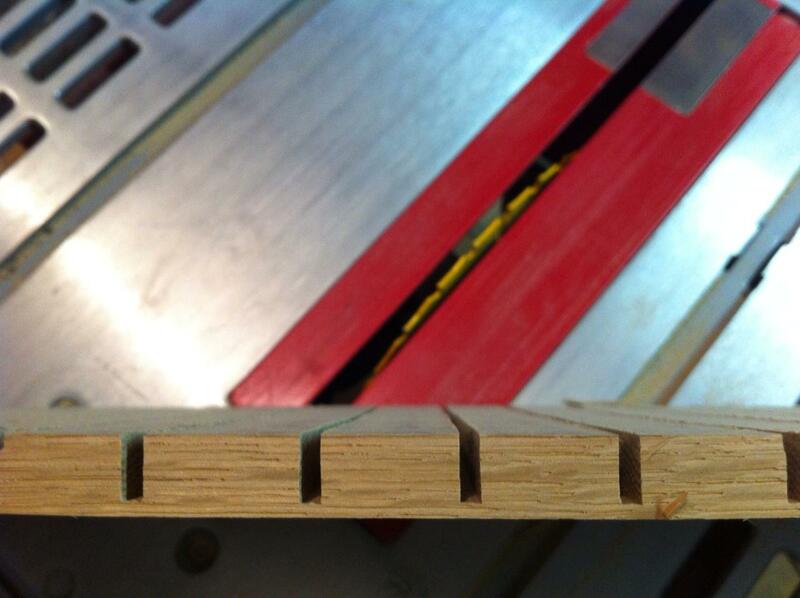 So for round two we decided to cut the cap into 3 thin sections and give each of them a slight kerf. Now we can bend 3 individual pieces and they can form their own radiuses. 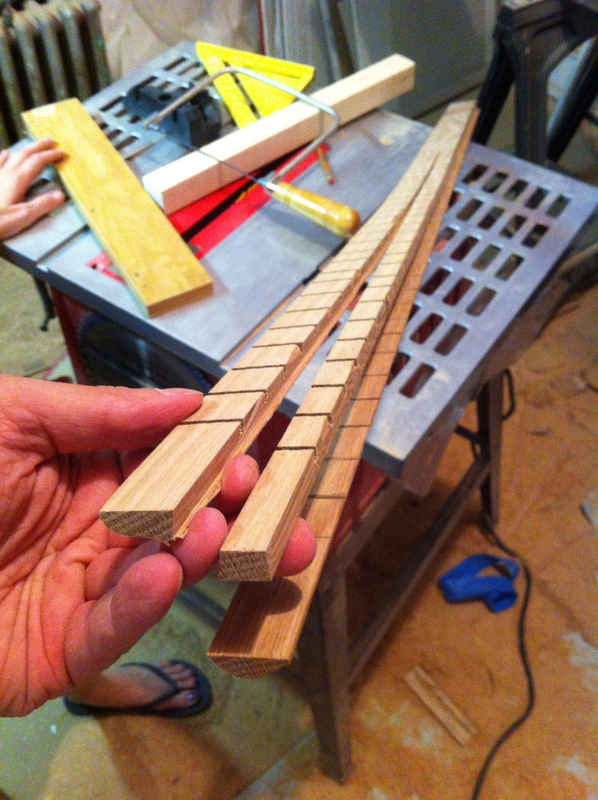 This also meant that they had to be cut to 3 different lengths at the end. 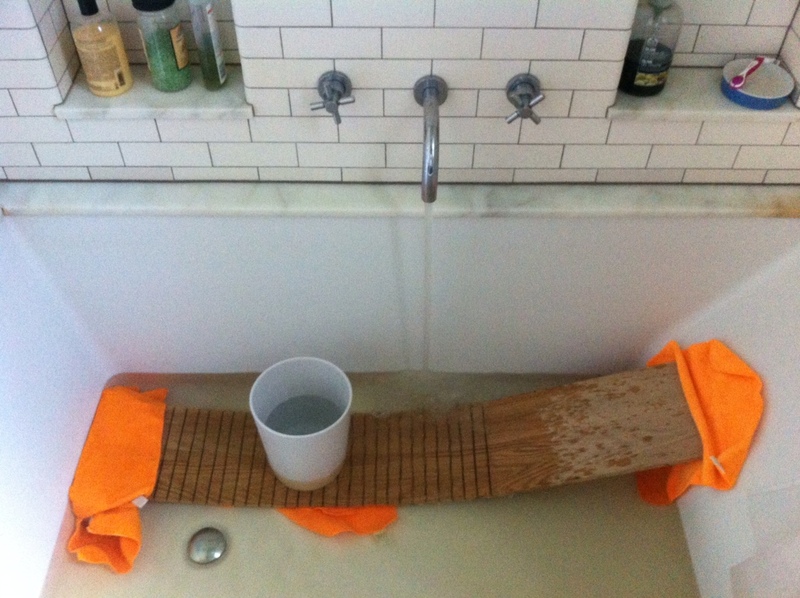 Then we went back to the soaking method for ease & we knew it would work. (I managed to make it fit in our concrete mixing pan which made Kelly happy that we weren’t using the bath tub again!) 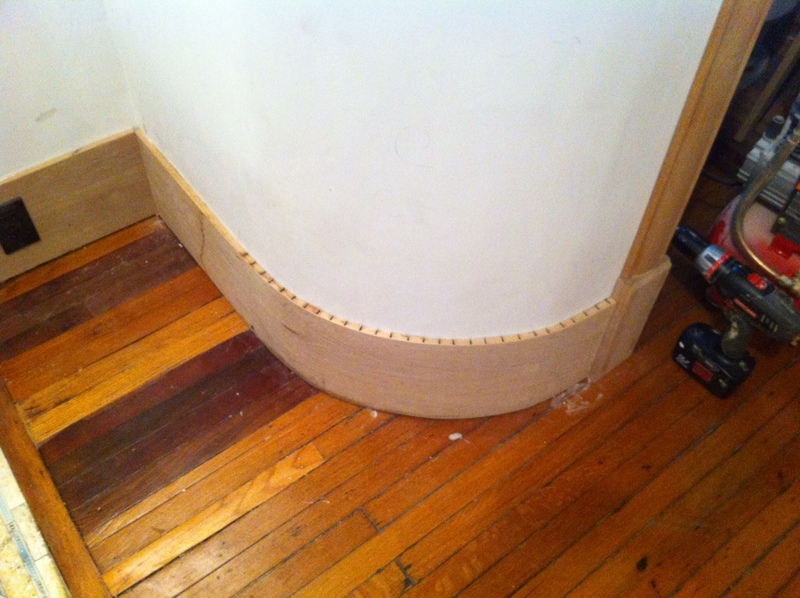 We used the water bucket in the center to weight the trim down to start to form the curve. This time the cap easily bent around the wall. We were really excited to get this done and it turned out great! 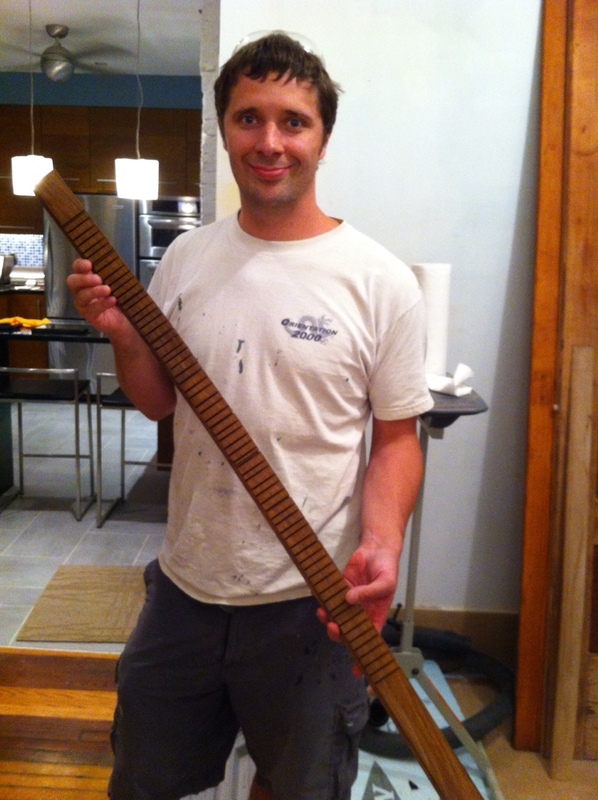 There is some wood putty and sanding to be done but the hard part is done. 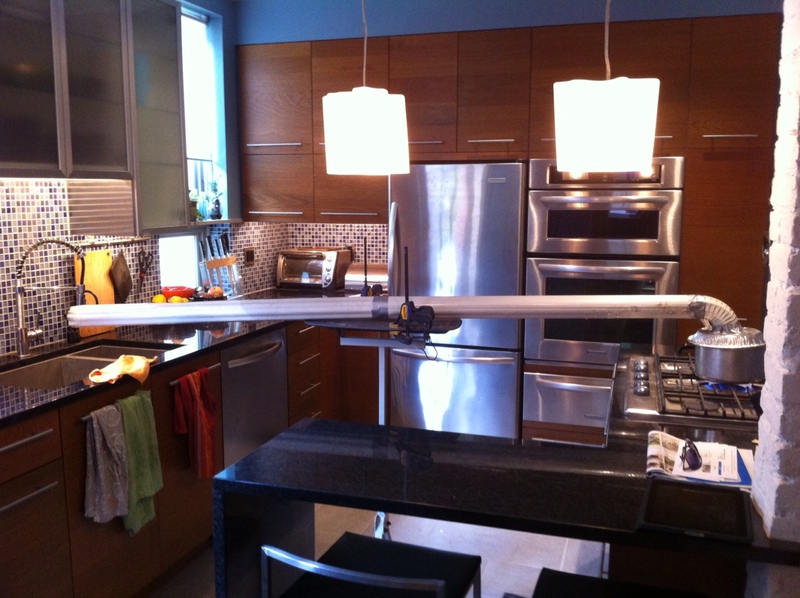 We have attempted many new things on this house reno, which sometimes worked out on the first try and others took a few. Either way we have been learning a lot and had fun along the way!